Over 25 years of studying, practicing, singing professionally, teaching and coaching voice, I came to the realization that I did learn at least as much about breath from my yoga practice as from all the wonderful voice teachers with whom I had worked. 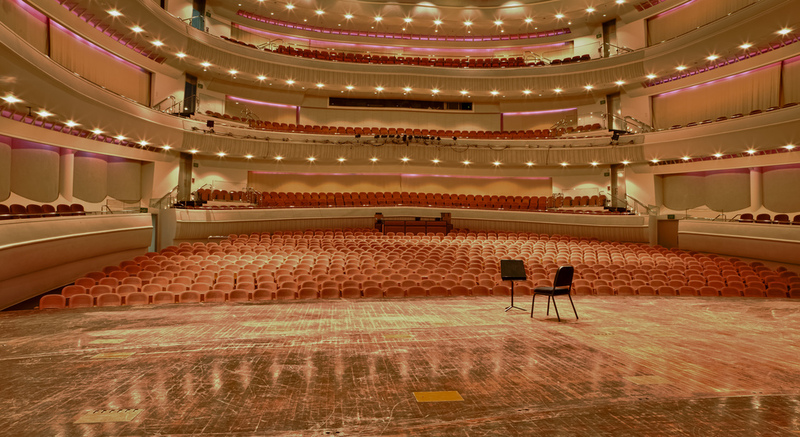 I will never forget the nervous tension of sitting on a stage in front of a large audience, waiting for my cue, trying to look intelligent and involved as the choir, orchestra, and other soloists, did their parts. My throat would want to accompany my shoulders as they tightened towards the hot lights above, and as the rest of my body put in a bid for rigor mortis. This state did not lend itself to fine singing. It was the practice of ujjayi breath, that I learned in yoga, while sitting there on that chair, that allowed rigidity to give way to flow, fear to creativity, and stress to adventure. What is the significance of our breath? Prana: life force, vital principle: from that first sacred inhale that initiates our individual beingness in this earthly experience, to that departing exhale that carries us through to the next mystery, this blessed process of exchange never ceases. Breath is our constant companion. Yet, unlike another constant function, our heartbeat, the breath can be studied, manipulated, explored, employed, enhanced, deepened, optimized. Sitting comfortably upright, gradually let your breath become slow and steady by creating a resistance deep in your throat. To find this resistance, practise clearing your throat gently, and hold on to the grip this creates. Slowly inhale and exhale while using this grip to control the flow of breath in and out. When this has become comfortable, continue as you assume wide-legged child’s pose. As you inhale, you will feel your abdominal muscles billow down toward the floor or your legs. At the same time you will feel a slight expansion in your lower back, as if you are a turtle whose shell is stretching out behind you. Become more and more intentional about this smooth, stretchy expansion in the lower back, while not forcing it. Let each exhale be a gentle squeeze that continues until you empty out the last bit of breath. You are using your diaphragm, which activates your vagus nerve. This stimulates your parasympathetic nervous system, which may leaving you feel grounded and secure. This breathing technique is one of the myriad ways that yoga has seemingly saved my life! But still, I procrastinate, make excuses, take shortcuts across my mat. I continue to learn about myself and my potential, and try to witness it through loving eyes. 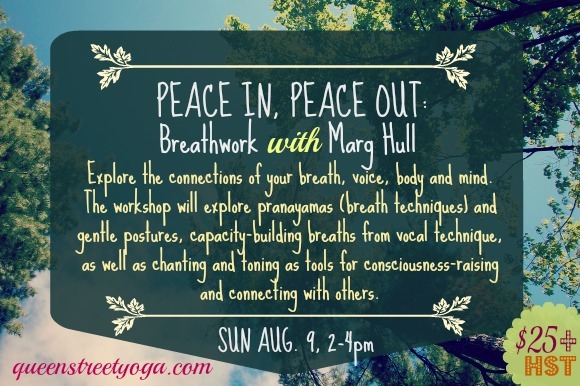 I really look forward to welcoming some yoga companions to share a piece of the journey with me during “Peace In, Peace Out” on August 9th at our beloved Queen Street Yoga. Marg has been practising and loving yoga since she first experienced it on a sandy, salty beach in 1974. 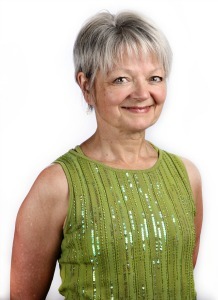 A classically trained singer, Marg found yoga principles invaluable as she performed and taught voice for many years, experiencing the empowerment of the body-mind-spirit connection. Ever a “morning person,” Marg is thrilled to share the joy of yoga with friends in QSY’s Sunrise Practice.